Microsoft may be removing the touchscreen-centric Charms Bar in Windows 9. A new report out of Winbeta says Microsoft will pull out the Charms tray completely as part of the user interface overhaul coming to the next version of Windows. The change will purportedly remove the Charms Bar completely on the desktop version of Windows 9 for computers and laptops. It's still questionable whether the pull out tray will be removed on tablets. ZDNet's Mary Jo Foley says her sources have confirmed the Charms Bar will wave good-bye on slates as well. As for what's replacing it, Window 9 will supposedly feature a revamped title bar for Windows apps that includes menus to list the charms components. Sharing options once found in the Charms Bars could also be repositioned to a dedicated share button on the app itself. The main reason behind the UI shake up seems to be about making the OS more welcoming to mouse and keyboard users. While users can simply hover their cursor over to a corner of the desktop screen in Windows 8.1, it can become bothersome over time. So far, the news surrounding Windows 9 has been a lot about making it look and work like a proper desktop operating system. Windows enthusiast site Neowin has reported that version nine might also sport all new virtual desktops. As the name might suggests, virtual desktops will allow users to create separate operating spaces within Windows. It's a useful feature for running multiple apps or groups of apps without clogging up the main window with too much multitasking. Virtual machines have been long supported on other operating systems like OS X and Ubuntu, as well as third-party apps for Window. However, this will be a first time Windows would support the feature natively. 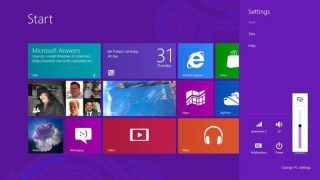 A preview version of Windows 9 is expected to drop in just a few months after which we could see the full retail version roll out by spring time next year. Until then stay tuned to this space for the latest on Windows 9.